We think and believe that a haircut is a necessity but to tell the truth it isn’t. Often a man’s job may require short hair but with women you just need it to be styled neatly. Well styled hair does help us to look our best and makes us feel better about ourselves. Photos are welcomed because it gives us a reference point to work from even if you want the front like this and the back like this other picture. Sometimes you may just want it longer or shorter than the picture. It helps us understand what you are talking about. Don’t have a picture? Available are many style books and we will help you find something that will flatter your appearance. We want you to look your best because you are our walking advertisement and we want you to keep coming back. 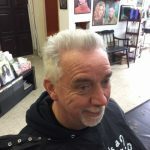 No matter what you are looking for men, women or children’s haircuts we will look after you. Whether you have long or short hair, straight or curly hair we have you covered with the perfect cut and style for any age and occasion. 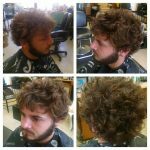 Many people love the idea of getting a new haircut so don’t be afraid of making a change or trying something different. There are always several ways to style the same haircut. You are at the right place whether you want to maintain your current style or be daring to try something new. In the last few years men are becoming more aware that fashion isn’t just about women. Not only are men wanting to look attractive but want to feel comfortable at the same time. Short haircuts have been the traditional or business look for men. Now they have a wide variety of stylish short haircuts that are attractive and masculine looking yet easy to manage and quick to style. 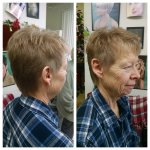 You want a style that will work for you even if it is one of the classic short haircut. We at Bruce’s call this just a “plain ole haircut;” off the ears and off the collar. It may be parted on either side, the middle or just brushed straight back. Clipper haircuts are very popular for men. A burr is short all over whereas a high and tight or fade is shorter on the sides than the top. How short and how long can be whatever length you like. Whether you want the hair all blended from the different lengths or not is another option. Square off the top and you have a flat top. Short haircuts are always in style! If you are feeling a little more venturesome try a pompadour cut which is trendy right now. The top is kept quite long and slicked back while the sides are clipped close and disconnected from the top. Especially great for men with round or square shaped faces. Shag haircuts are popular for longer hair. Especially great for wavy and curly hair. 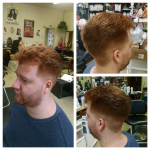 While the popularity of longer men’s styles is growing short haircuts will remain the king because of their clean cuts and precise styling. Use a variety of different products from the Mitch or Tea Tree products of Paul Mitchell and you are ready for any occasion from work to a night on the town. Women have always been more aware of fashion than men. Our reasons for looking our best from childhood and fixing our baby dolls hair to being Grandma in the family portrait changes in each step of life we take. In school we want to look attractive to show off and to get the young men to look at us. Of coarse there are always those special occasions such as prom and our wedding to resist getting our hair cut but we should still keep a small trim regularly so those updos whether they have curls and\or braids look smooth. Long hair is romantic Curls are feminine and will always be stylish. As we mature excessive long hair can become our worst enemy. The extra weight can pull down our features causing us to look older. It could be time to start looking at some mid-length hair styles. Mid-length hair styles include all the bobs. Bobs are one of the most versatile cuts for women. You can pick just about any length from the ears to the shoulders. It can be blunt and all one length. Add a few layers to soften the look and give some movement for straight hair. The more layers your hair has, the fuller and fluffier the hairstyle will be. Great cut for curly or wavy hair. Bangs is another way to spruce up this cut. Straight full bangs or longer side swept bangs are a great way to change the look. But be careful if you have a stubborn cowlick, it will be boss. Once you commit to short hair there is no going back. It take time and patience to achieve long hair again. To be truthful though most of us are too busy to spend a lot of time on our hair. Many of us want styles that are fast and easy. With the many variations of the classic pixie it can be personalized to enhance any face shape; round, square, heart shaped or the coveted oval shape face. When choosing a hair cut and style keep in mind your hair type and texture. The secret to controlling curly hair is to work with the curls, not against them. The same holds true with wavy hair. A medium to long style is your best choice. Short your hair may become too poufy. Sometimes curly hair gets curlier the shorter it is cut but with others the longer and heavier it gets drags the curl looser. Whatever the case may be let the curl and wave benefit you. Texture is whether your hair is coarse or fine, not to be confused with the amount of hair you have, thick or thin. Your hair may be fine but you have an abundance of it. Thick hair can accommodate most cuts but if your hair is thin it may look stringy as it gets long. 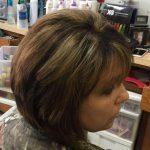 Remember not only does the haircut make the style but so does the color and styling products you use. So when you are looking at pictures, ask yourself what is it you like about the style. How much time do you want to spend on the upkeep? It will be our pleasure to guide you to make the best choice of style to looking great. When trying to pick a style for the child’s first haircut keep it simple. To be still for five minutes is a long time for them to sit there especially if they are not familiar with the salon. Bring them with you when your visit will only take a short time. We have a play room so they can get use to us and their surroundings before their first visit. We also have a certificate for the “First Haircut” to be put in their baby book. 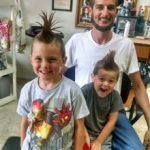 Adventurous boys with understanding parents may want to try a Mohawk. This is surely one of the most famous haircuts. It is named afte r the Mohawk tribe of Native Americans. Their warriors would frequently shave their heads saving one strip in the middle. This style was said to inspire fear in their enemies. If this is too dramatic you can always get a short haircut and use some gel to make it look like a Mohawk. Young ladies love looking like a Princess with bouncy curls. You can see the twinkle in their eyes when you fix their hair. Keep it simple. 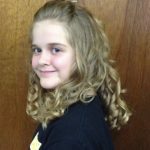 They are just beginning to learn how to take care of their hair and Moms need to help them. Pony tails are always a life saver for those busy mornings or a day at the park. Short bobs are another easy style for both to take care of. Teens are another story. They are still looking for their own unique and sometimes wild look. Some parents may find the style their teen wants is a bit too aggressive. Many teens just want to try it before they enter the adult world. They may want to get it out of their system. Rules are out the window as to what is in style or not. One of the trendy styles for our young men is mid length shag haircut that sways back and forth when moving their head back and forth. 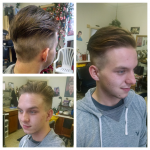 Highlighting the shag hairstyle has grown into one of the most trendy haircuts for boys. The other is the man-bun which is another way to wear the pompadour cut. 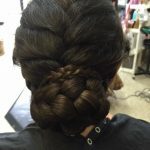 On the other hand the young ladies are keeping their long locks for those beautiful updos at dance and prom dos. Color whether it be highlights, ombre or whatever they can imagine is an option to changing their appearance. They are looking for tousled, touchable look and making it simple. Products that can add volume and crunch-free hold and leaving the hair feeling clean and fresh are on the top of their lists of demands. Products such as Paul Mitchell’s Neon or Invisiblewear product lines to add texture and volume is a must.